I needed to give this post the time it deserved. And that couldn't be rushed. There was one lesson in particular that I knew in my heart that I needed to share with you, but I couldn't quite put it into words.... until now. I prayed and I came to realise that not posting during those busy weeks was a far better idea than posting - because what I would have pressed publish on wasn't what my heart wanted to share. So now that I have the time, let's look at John 20 and look at these incredible moments together - shall we? I love every moment in this chapter and it's perhaps one of my favourite passages in the Bible. The fact that it was women (who were so little heard about in the Bible and who were recognised so little during that time) who were first given the job of spreading the Good News. The fact that the burial cloth laid there in exactly the same position it was on Jesus because He no longer needed those trivial earthly garments. The very fact that all of this was recorded so that we could know the joy and importance of these very moments. In the last chapters we saw Jesus suffer. We saw Him in pain, beaten, mocked, bleeding, dying - and now we see Him overcome all of that. We see Him rise. We discover that our God is not an unseen distant, dead God - He is well and truly alive. On the cross, Jesus turned tragedy into triumph. He turned our tragedy into triumph. But there is one thing in particular I want to focus on that isn't in these chapters at all. It's the in-between part - and it's quite possibly very similar to what you may be feeling right now. I want you to imagine yourself as John. You're a friend of Jesus - in fact, you may even consider yourself Jesus's best friend here on earth. You walked by Him through cities, you witness His miracles, you knew Him - and you had to watch Him die when you couldn't do a think. That Friday Jesus died on the cross would have been incredibly heart breaking for John. Could there have been a greater tragedy for John than a dead Jesus? He'd spent all of his life proclaiming His name and His goodness - and now He was gone. John had left everything he'd ever known - his career, his home, his family - and he put all of his eggs in one basket... Jesus's basket. At the beginning of the week, John had experienced what was essentially the equivalent of a ticker tape parade as Jesus entered Jerusalem - and now here he was, alone. John didn't know on that Friday what we know now. John didn't know that Friday's tragedy would be a triumph just three days later. John was stuck in the middle. He says it right here in John 20; "They still did not understand from scripture that Jesus had to rise from the dead"
We don't know what John did on that Saturday as it wasn't recorded - but it's perhaps the most important part of his story. All we know is this; when Sunday rolled around, John was still there. John's friend and future were seemingly long gone. You'd think he would have left, wouldn't you? When you have no hope sometimes you just want to give up and give in - but John stuck around. I want you to apply this situation to your own life, because, regardless of who you are, we all have these "Saturdays". How do we react when we get to a "Saturday" in our life? When we're between yesterday's tragedy and tomorrow's triumph how do we react? What we should be doing is taking a leaf out of John's book. Like John, we need to stay close to Jesus during these times. Because John stayed near Jesus on that very Saturday, he was there to see the great triumph that came on Sunday. Our God is great at taking tragedies and turning them into triumphs - and He can do something similar in our own lives, we just need to stay close to Him during those Saturdays so that we can rejoice in the Sundays to come. 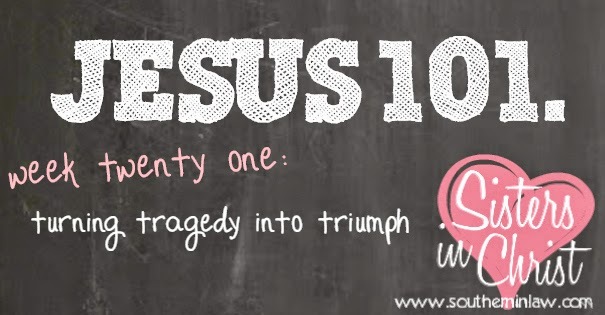 Jesus overcame death - don't you think He can overcome our little problems in life? Jesus died on that cross and when He rose, our graves were changed from a final resting place to temporary housing. We love and walk with a God who is bigger and greater than anything we could ever imagine - and He is wider and taller and stronger than any storm we face. Today I want you to remember to be like John. When you get to a Saturday in your life, hang in there - because you may be just moments away from your Sunday. But tell me, do you have any tips for someone currently facing a "Saturday" in their life? I've been facing a bit of my Saturday in my life throughout the last couple of months and day after day I am reminded to rely on Jesus - that's what's getting me through as well as the love and prayers of my fellow brothers and sisters in Christ! LOVE LOVE LOVE this, best thing I've had since I went gluten free, used 1 cup Aldi's baking mix, 1 cup brown rice flour and 1 cup of the oat flour, used real butter and milk and put raspberries in it, tonight I'm going to make one with rhubarb as I feel this is the perfect cake to add rhubarb to! :D THANK YOU! I should note that I used 2 cups of oat flour because I doubled the recipie and made it in a 9x13 pan. Delicious!